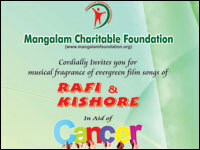 Mangalam Charitable Foundation NGO is dedicated to the noble cause of the society, serving the under privilege, cancer patient and other philantropic work is organizing a Unforgettable Evening with Musical fragrance of evergreen songs of Rafi and Kishore Kumar by Anmol Entertainment with popular like Anil Bajpai, Sandeep Shah, Ajit Mestry, Sampada Goswami, Swati Choudhary and others. The event will be held on Sunday, February 22, 2015 from 8.45 pm onwards at Vishnudas Bhave Auditorium, Vashi, Navi Mumbai towards the aid of cancer patient. Mr. Prabodh Thakker, President Indian Merchant Chamber, Mumbai has consented to be the Chief guest on this occassion. Download E-Ticket from here and call 9167157626 / 9324545164 for seat number. Donate generously for noble cause.